Earlier this week we could have used a car poncho to cover our cars. I know there already are car covers, but who covers their car at work? Had we known that there was going to be an aerial assault on our vehicles, we may have actually pulled a few rain ponchos from our sample bin and arranged them to fit. It was a regular weekday at 5:00pm, and we were leaving the office and heading for our cars. Imagine our surprise to find that our cars had been under attack. 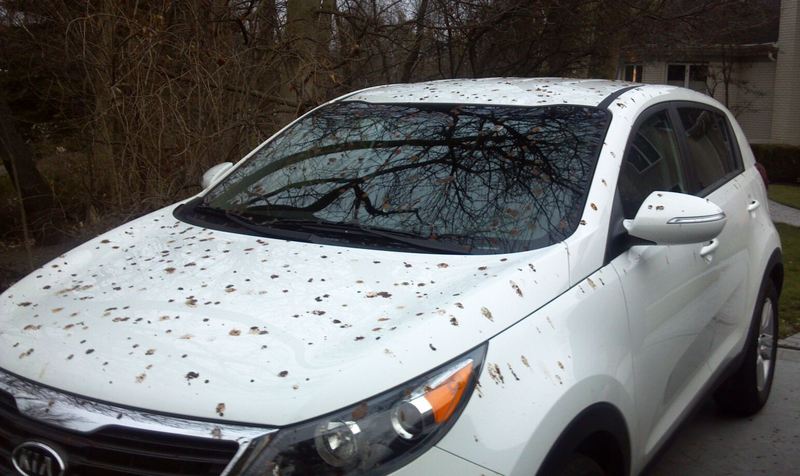 We had been “bird-bombed” like nothing we have ever seen before! 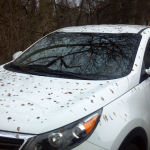 My van is dark green, so the “mess” wasn’t as obvious at first glance, but on a co-worker’s new white car, it was quite a shocking sight (see photo). And it wasn’t just our cars. The mess extended at least 20 feet in front of and beside the vehicles. We still don’t comprehend how many birds it would have taken, acting in concert, to accomplish this over such a large area. It was a strange, disgusting sight to see! So, a rain poncho (or several of them) over our cars would have been useful and would have kept us from having to make an unanticipated trip to the car wash. Though no one could have anticipated this, it’s an event we won’t forget for a long time. Oh, and it may make me think about carrying an umbrella every trip through the parking lot, regardless of the weather!